AV1 has been all consuming from a mindshare perspective for many streaming professionals, but the fact of the matter is that unless you’re distributing stream quantities on par with Netflix, YouTube, Amazon, and Hulu, AV1 won’t be relevant for at least two years, maybe longer. I discuss why in my Streaming Media article, Return of the Codec Wars: A New Hope—a Streaming Summer Sequel. The above table from the article gives you a color-coded reason why – just too many reds and oranges, not enough greens (click the table to view it at full resolution). 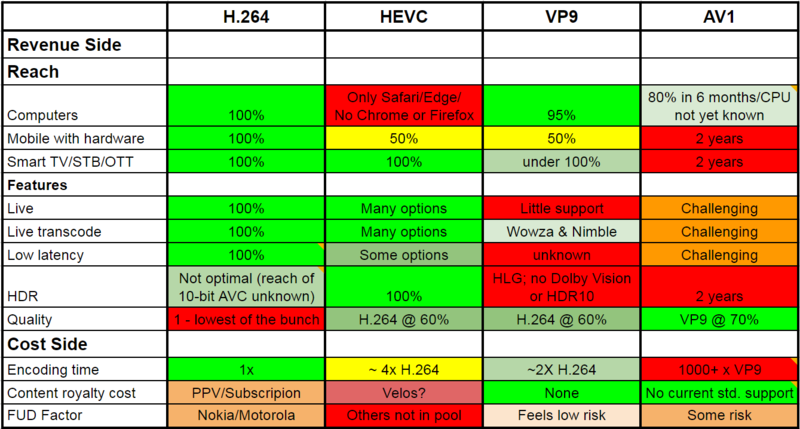 If you’re wondering about the strengths and weaknesses of H.264, HEVC, VP9, and AV1, click over and read the article.